As a main source of nourishment for over half the world's population, rice is by far one of the most important commercial food crops. Its annual yield worldwide is approximately 535 million tons. Fifty countries produce rice, with China and India supporting 50% of total production. Southeast Asian countries separately support an annual production rate of 9-23 million metric tons of which they export very little. Collectively, they are termed the Rice Bowl. Over 300 million acres of Asian land is used for growing rice. Rice production is so important to Asian cultures that oftentimes the word for rice in a particular Asian language also means food itself. Classified in the genus Oryza, there are two species of domesticated rice— O. sativa and 0. glaberrima. 0. sativa is the most common and often cultivated plant, occurring in Africa, America, Australia, China, New Guinea, and South Asia. The natural habitat of rice is tropical marshes, but it is now cultivated in a wide range of subtropical and tropical habitats. Unlike other agricultural crop grasses, rice plants thrive under extremely moist conditions and moderate temperatures. The ideal climate is roughly 75° F (24° C). Average plant height varies between 1.3-16.4 ft (0.4-5 m). Its growth cycle is between three to six months (agriculturally, this is broken down into three phases lasting approximately 120 days). Rice plants produce a variety of short- to long-grain rices, as well as aromatic grains. In any event, it wasn't until the development of puddling and transplanting of the rice plant that the spread of rice as an agricultural crop really began. Practiced in the wetlands of China, the concept of the rice paddy was adopted by Southeast Asia in roughly 2000 B.C. Wetland cultivation techniques migrated to Indonesia around 1500 B.C. and then to Japan by 100 B.C. To the West, rice was also an early important crop in India and Sri Lanka, dating as far back as 2500 B.C. and 1000 B.C. respectively. The spread to Europe, Africa, and America occurred more slowly, first with the Moor's invasion of Spain in 700 A.D. and then later to the New World during the age of exploration and colonialism. Rice has been grown in the United States since the seventeenth century in such areas as the southeastern and southern states, as well as California. 1 Prior to planting, minimal soil manipulation is needed to prepare for cultivation. If the rice will be grown on a hilly terrain, the area must be leveled into terraces. Paddies are leveled and surrounded by dikes or levees with the aide of earth-moving equipment. The cultivation of rice begins by planting water-soaked seeds in a properly prepared bed. Oftentimes, the seedlings are transplanted to the paddy when they reach a certain size. When the grains begin to ripen, the water is drained from the fields. Harvesting begins when the grain yellow and the plants start to droop. Depending on the size of the operation and the amount of mechanization, rice is either harvested by hand or machine. Once harvested, the rice is usually dried in the fields with the help of sunshine. Then, the fields are plowed before planting. In the United States, rice is most often planted on river deltas and plowing is accomplished with a disk plow, an off-set disk plow, or a chisel. Adequate irrigation of the terrace or river delta bed is required and accomplished by leveling and by controlling water with pumps, reservoirs, ditches, and streams. 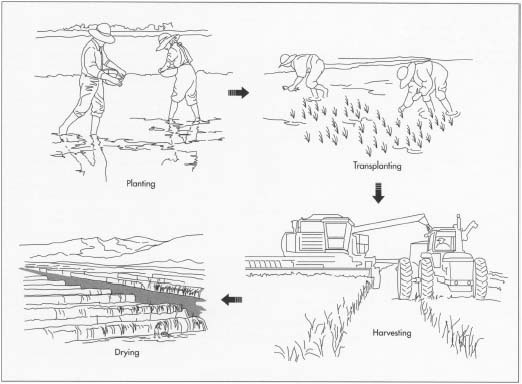 3 Depending on the level of mechanization and the size of the planting, seeding occurs in three ways. In many Asian countries that haven't mechanized their farming practices, seeds are sown by hand. After 30-50 days of growth, the seedlings are transplanted in bunches from nursery beds to flooded paddies. 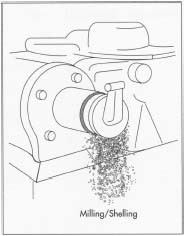 Seeds can also be sown using a machine called a drill that places the seed in the ground. Larger enterprises often found in the United States sow rice seed by airplane. Low-flying planes distribute seed onto already flooded fields. An average distribution is 90-100 lb per acre (101-111 kg per hectare), creating roughly 15-30 seedlings per square foot. At the processing plant, the rice is cleaned and hulled. At this point, brown rice needs no further processing. If white rice is desired, the brown rice is milled to remove the outer bran layers. sickles. This practice still occurs in many Asian countries. Rice can also be harvested by a mechanized hand harvester or by a tractor/horse-drawn machine that cuts and stacks the rice stalks. In the United States, most operations use large combines to harvest and thresh—separate the grain from the stalk—the rice stalks. 12 The now light-colored grain is cooled and polished by a brush machine. 13 The smooth white rice is conveyed to a brewer's reel, where over a wire mesh screen broken kernels are sifted out. Oftentimes, the polished white rice is then coated with glucose to increase luster. With one out of every three people on earth dependent on rice as a staple food in their diet and with 80-100 million new people to be fed annually, the importance of rice production to the worldwide human population is crucial. Scientists and farmers face the daunting task of increasing yield while minimizing rice farming's negative environmental effects. Organizations such as the International Rice Research Institute (IRRI) and the West African Rice Development Association (WARDA), and Centro Internacional de Agricultura Tropical (CIAT [International Center for Tropical Agriculture]) are conducting research that will eventually lead to more productive varieties of rice and rice hybrids, use of less water during the growing season, decrease in the use of fresh organic fertilizer that contributes to greenhouse effect, and crops more resistant to disease and pests. Huke, R.E. and E.H. Rice: Then and Now. International Rice Institute, 1990. Johnson, Sylvia A. Rice. Minneapolis, MN: Lerner Publications Co., 1985. "Limiting Rice's Role in Global Warming." Science News (July 10, 1993): 30. Normile, Dennis. "Yangtze Seen as Earliest Rice Site." Science (January 17, 1997): 309. Riceweb. http://www.riceweb.org/ (June 29, 1999). The Article is very precise and upto the point with many modern techniques of growing rice.If you can put few Rice processing videos for practical knowledge the article may become more usefull while implementing the same.